Scanning electron microscograph of vessel member from Pelargonium leaf with perforations and pits. 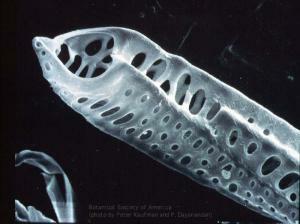 Micrograph, courtesy of Professor Peter B. Kaufman and Dr. P Dayanandan, Dept. of Botany, Univ. of Michigan, Ann Arbor, MI.